Για εκείνους που θέλουν να απολαύσουν τα αξιοθέατα και τους ήχους της πόλης Γκαγκνέγκ-σι, το Gangneung Station Guesthouse είναι η ιδανική επιλογή. Από εδώ, οι επισκέπτες μπορούν να έχουν άμεση πρόσβαση σε όλα όσα η πόλη έχει να προσφέρει. Από τη βολική της τοποθεσία, η ιδιοκτησία προσφέρει εύκολη πρόσβαση σε κορυφαίους προορισμούς της πόλης. Το Gangneung Station Guesthouse προσφέρει άψογη εξυπηρέτηση και όλες τις βασικές ανέσεις στους ενθουσιώδεις ταξιδιώτες. Μια επιλογή από εξαιρετικές ανέσεις όπως τα δωρεάν WiFi σε όλα τα δωμάτια, ημερήσιος καθαρισμός, υπηρεσία ταξί, υπηρεσία εισιτηρίου, φύλαξη αποσκευών σας περιμένουν στο ξενοδοχείο. Η ατμόσφαιρα του Gangneung Station Guesthouse αντανακλάται σε κάθε δωμάτιο. Στην ιδιοκτησία θα βρείτε κρεμάστρα ρούχων, δωρεάν καφές φίλτρου, δωρεάν τσάι, ηλεκτρική κουβέρτα, δωρεάν ποτό καλωσορίσματος, καθώς και πολλά άλλα. Εξάλλου, το ξενοδοχείο διοργανώνει πολλά ψυχαγωγικά δρώμενα έτσι ώστε να έχετε πολλά πράγματα να κάνετε κατά τη διαμονή σας. Απολαύστε τις ασύγκριτες υπηρεσίες και μια πραγματικά περίβλεπτη διεύθυνση στο Gangneung Station Guesthouse. The gueshouse was just 5 min walk to the train station, where you can grab the bus easily there as well. The host helped us a lot in our stay in Gangneung. The room was very cozy and clean. A really friendly host who made us feel at home at Gangneung. Received a lot of help in getting around Gangneung. He even volunteered to drive us to the bus station. The owner is incredibly nice and helpful. He does everything to make you feel like home. The room was spaciouse, clean and furnished with love and care. The place itself is clean and very cosy, just like a home. And Hoon the owner is friendly and very helpful with suggestions of where to go and with instructions on how to get to those places. Location is very near to Gangneung Station and the bus stop. I enjoyed my stay! Sorry for lately comment. First, thanks for friendly welcome. The host Hoon is very kindly and what i can feel is he wants to introduce gangneung as well. The rooms is so clean and warm, we slept so well there! Fresh breakfast what Hoon made by himself!So awesome! Hoon is very nice, he asked us about the trip schedule to check if we had good plan or not, haha. I really want to prefer here to everyone not just because the room and Hoon but also people what I met there. People are so so so so friendly and the wonderful seaside/sakura view I never forgot... Food is amazing, too!!! Thanks for memorable experience, I hope to be there ASAP! The host, Hoon, is probably one of the friendliest hosts you can ever find. He has been extremely helpful by doing everything to make us feel welcomed. He even prepared authentic Korean breakfast for us even though we have to leave the house quite early in the next morning. Location wise is great too. It is very close to the new Gangneung KTX station and the downtown area where you can find great food. Both within walking distance. Rooms are very nicely decorated and the house is extremely cozy. Thanks Hoon! Dear Noramalina, Thank you for spending time with me and lovely Card and Maggi ! It was so much fun to visit Trout festival with you guys even four of us could not catch Trout. Thank you for bringing warm heart during cold winter season. !! It was nice memories to spend two nights at here with you guys. 감사합니다. Second stay and once again the host was amazing. Thank you for your 2nd visiting !! Liam was my first guest since I'm open this place ! It was my pleasure to celebrate year end and new year ! Because of your visiting, I could start this work much more happily 감사합니다. ! Dear Felicia, How are you ? It was my pleasure to spend time with you guys :-) Next time let's go to the beach to catch Crabs !! (but not during the Winter season.. it's too cold haha) Take care ! Hoon also introduced us local specialties foods to try. Thks a lot to Hoon! The guesthouse is near to bus stop. No problem to take bus to bus terminal. The guesthouse is not at the main road. But guest house owner provide us the map and bus detail before we depart to there. The guesthouse owner stay at the guesthouse is very helpful. He helps us to book bus tickets and try help us to rearrange our plan to be perfect. Each day of breakfast is different. Thanks to Hoon for the superb service! The place is in a quiet street, but not too far away from the bus. The host is exceedingly kind and interesting. The price is very reasonnable. Highly recomnended. Dear JH Thank you for your staying and good review :-) Hope to see you again ! The host is a young guy. He is very nice. He gave us several tour information of Gangneung, and guided us to the bus stop when we left. The little guesthouse is beautiful and romantic. The guesthouse is near the rail station. The bus station to the beach and Gyeongpodae is 3 minutes from the guesthouse by foot.The We had nice memory in Gangneung. Dear Zhaojun, Thank you for your warm reivew on my place :-) Finally new station is opened and things are much easier to travel around. Good to hear that you had good time in Gangneung ! Hope to see you again, ! It was a great weekend stay at Gangneung Station Guesthouse. Hoon took great care of us making sure we had everything we needed. He brought us tea and made us feel welcome. We went to the Sunrise festival together. The stay was an all around great experience. Thanks for the great time. Liam was my first guest since I'm open this place ! It was my pleasure to celebrate year end and new year ! Because of your visiting, I could start this work much more happily 감사합니다. ! 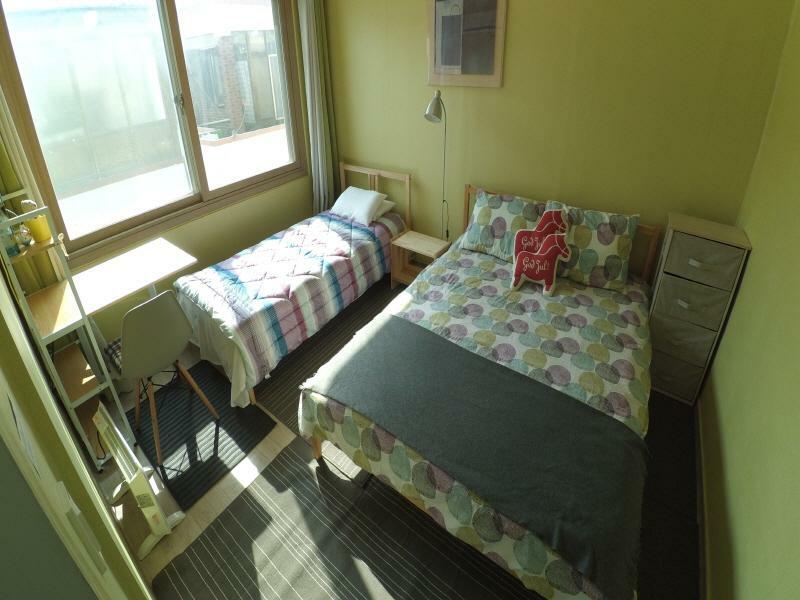 The Guesthouse is near the Gangneung Station and bus stop. Hoon is a nice host. He helped us a lot when we travelling Gangneung. Please try the Sashimi shop (next to the supermarket/guesthouse) that suggested by Hoon. Dear Michio San, It was my pleasure to talk with you :-) due to time limit, we could not talk more but I believe that we can meet again ! Thank you for visiting my place and I'm very surprised about your efforts to learn Korean language. 짧은 시간이었지만, 제 친구와 저희 집 그리고 정동진으로 이동하며 보낸 시간은 너무 즐거웠습니다. 주신 사진도 정말 좋은 기억이 되었습니다. 정말 감사합니다. Gangneung Station στα 0.49 χλμ.